The 21ST CENTURY BUSINESS SERIES is an innovative instructional program providing instructors with the greatest flexibility to deliver business content using a modular format. Instructors can create their own business courses by combining several Learner Guides in the Series to form one-semester or two-semester courses. The individual Learner Guides can also be used as enhancements to more traditional business courses or to tailor new courses to meet emerging needs. The design and content of each Learner Guide in the 21ST CENTURY BUSINESS SERIES is engaging yet easy for students to use. The content focuses on providing opportunities for applying 21st skills while enabling innovative learning methods that integrate the use of supportive technology and creative problem solving approaches in today's business world. 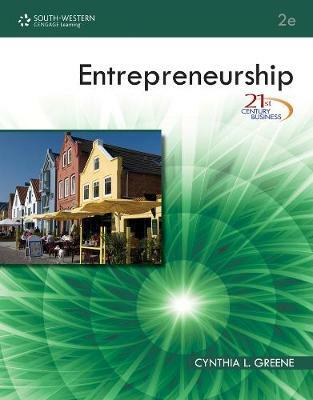 The ENTREPRENEURSHIP LEARNER GUIDE covers today's most relevant business topics including the role of entrepreneurship in the global economic recovery. Information on marketing functions to reflect the latest Marketing Standards identified by the Marketing Education Resource Center is included as well as topical data on how to conduct research and the important value of research as a part of entrepreneurship.